Click here to view our Twitter stream for photos and reports from a dozen different sites. 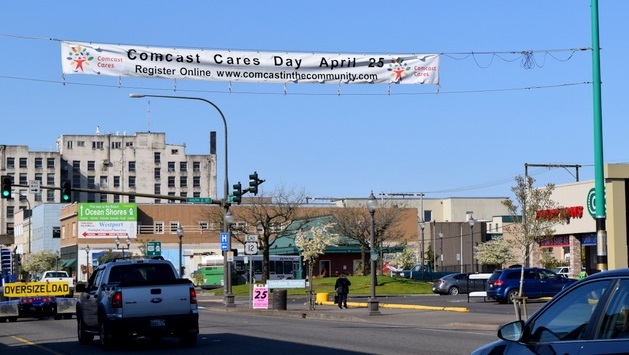 On Saturday, April 25, 2015, more than 3,200 local Comcast NBCUniversal employees and their families, friends and community partners will “make change happen” as they volunteer to improve a dozen locations throughout Washington State as part of the 14th annual Comcast Cares Day. We’re helping the city of Aberdeen clean 16 blocks of downtown on Saturday. Here’s just one way the city is getting out the word. Aberdeen: Downtown Aberdeen Revitalization. We’ll let the local team share their enthusiasm for this project in their own words, found on the signup age: “April 25th is not just a clean-up & beautification of Downtown Aberdeen: it is an EVENT!! This is a community-wide clean-up of our beloved downtown area. It’s an opportunity to help make a difference in our city! We’ll be weeding, sweeping, cleaning curb lines, clean up of flower pots, planting flowers and hanging flower basket brackets (to prepare for the hanging of flower baskets after Mother’s Day in May). We’ll have live music from our local radio stations, lunch, t-shirts, and a community spirit that can’t be beat! This project isn’t just about cleaning, it’s about community pride! Come help make Aberdeen a better place, a cleaner place, and a place filled with colorful flowers!” AmIright about the enthusiasm? (Partner: City of Aberdeen, which is working with the Aberdeen Revitalization Movement. Here’s a story in advance by the Daily World. Auburn: Auburn YMCA. Employees based in our Auburn offices will transform the YMCA’s Summer Camp area by building raised flower beds and planters and of course also planting the flowers. We will also be repainting several picnic tables and landscaping the area. We will be spreading bark in their playground area and doing some weeding. We will also be helping the YMCA set-up for their annual Healthy Kids Day. They are expecting over 5,000 community members, and we will be assisting them by handing out their official T-shirts, and helping them set up and run several carnival games as well as some other duties. Read what the Auburn Reporter has to say about the event. Bellingham: The Firs. Our team will volunteer at The Firs Fircreek Day Camp, Retreat Center, and the Discovery School Campus. The Discovery School is a small specialized public school program that serves all the schools in Whatcom County. We will be painting the Rutledge Building, home of the Discovery School program. We will be cleaning the grounds of winter debris, doing work like picking up fallen tree limbs and entire trees. Other projects: raking landscaping beds and spreading beauty bark; cutting ivy out of a stand of trees; filling a play area with wood chips; cleaning out and refilling a giant sand play area; and trimming apple trees. Lakewood: Custer Elementary School. Employees will be beautifying this Clover Park School District school through painting and gardening and other improvements. Read a news story about the Custer project. Marysville: Marysville – Pilchuck High School. It’s no secret that this school suffered a horrible event last year. So Comcast is honored and privileged to conduct a wide variety of outdoor and indoor projects for all ages including painting, landscaping and general cleaning.This project is being organized by employees from our Everett and Lynnwood call centers. Here’s what the Marysville School District is saying about the big day. Orting: Washington Soldiers Home. We are very excited to be partnering with the Washington Soldiers Home for Comcast Cares Day for a second year. We have a wide variety of projects planned, including multiple painting projects, landscaping, headstone cleaning and some light construction. This is organized by employees based in our Puyallup offices. Read a news story about this project. Redmond: Little Bit Therapeutic Riding Center. Employees will help beautify this 17-acre facility at one of the largest therapeutic horsemanship programs in the United States for children and adults with disabilities. This project will consist of spreading gravel in the horse paddocks, fence washing, shed building, weeding and some outdoor barn painting. There will even be a “Stomp the Mole Hill” project for the kids. Comcast Cares Day volunteers will paint this mural which celebrates the heritage of Seattle’s International District. Seattle: Comcast Cares Day presents the Chinatown/ID Spring Clean. This is the second consecutive year that the Seattle site will be in the International District. 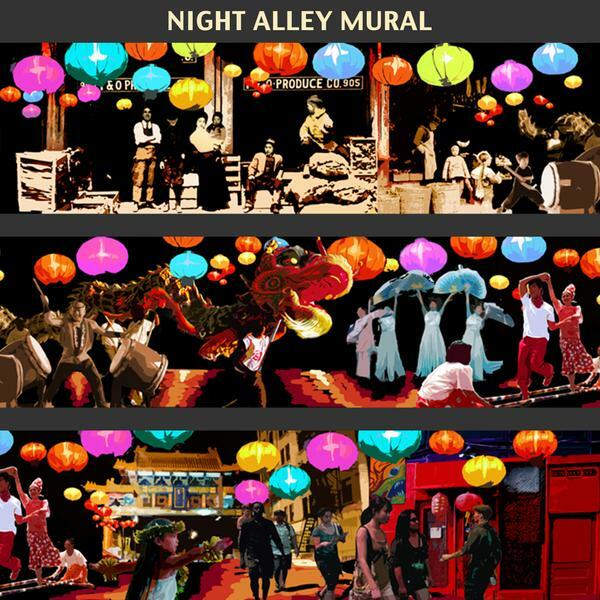 (if you have a good memory, you might recall the music video that came out of the day) This year, Comcast employees will paint an 80-foot-long community mural on wooden panels to be installed onto the wall of a historic building. Volunteers will canvass the neighborhood painting over graffiti, cleaning store fronts, picking up litter and renovating the Danny Woo Community Garden. Volunteers will also assemble furniture, donated by Comcast, for a new neighborhood co-work space that will serve as a springboard for budding new businesses. (Partners: SCIDpda is a non-profit organization dedicated to preserving, promoting, and developing the Seattle Chinatown International District. Other partners include City Year Seattle/King County, and the Chinatown-International District Business Improvement Area (CIDBIA), InterIm Community Development Association, and Asian Counseling and Referral Services. Spokane Valley: Spokane Valley Partners. Home to the largest food bank in Spokane County, this organization supports economically-disadvantaged families by also offering a free clothing bank, emergency assistance with utilities, a community garden, a weekend food program for homeless students and more. Here we’ll be painting, gardening, building crop beds in a community garden and landscaping. Tenino: Wolf Haven. This is the second year our employees from Olympia will base their project at this highly-regarded wolf sanctuary. We’ll be painting indoors and outdoors, and doing some grounds cleaning such as pulling weeds and raking debris. Here’s a story in advance from the Centralia Chronicle. Various: Blood Drives:We have several of them: April 15, Auburn; April 20, Fife Call Center and Olympia; April 21, Lynnwood Call Center; April 23, Puyallup; April 28, Everett Call Center; and then two dates in Spokane, April 16 and 28. VetNet: This year, our employee #VetNet groups, which consist of veterans and their supporters, will be hosting Comcast Cares Day projects. They’ll be making no-sew fleece blankets to donate to AMVET. These events will be Saturday, April 18, in Puyallup and Spokane, and Friday, April 24, at our Lynnwood Call Center. This year, the Company expects more than 95,000 Comcast and NBCUniversal volunteers to participate in more than 700 projects across the country and around the globe. To date, volunteers have contributed more than 3.7 million service hours to improve nearly 6,000 projects in the U.S. and around the world since Comcast Cares Day started in 2001. The Comcast Foundation will also provide grants to local community partner organizations across the country on behalf of everyone who volunteers on Comcast Cares Day. The grants will help Comcast’s community partners continue their mission of serving the community throughout the year. To date, the Comcast Foundation has awarded more than $16 million in grants to local non-profit organizations who have partnered with us on Comcast Cares Day. Comcast has been committed to serving local communities since our founding more than 50 years ago. For more information on Comcast’s volunteer and community investment initiatives, visit www.comcast.com/community. The Comcast Foundation was founded by Comcast Corporation in June 1999 to provide charitable support to qualified nonprofit organizations. The Foundation primarily invests in programs intended to have a positive, sustainable impact on their communities. The Foundation has three community investment priorities—promoting community service, expanding digital literacy, and building tomorrow’s leaders. Since its inception, the Comcast Foundation has donated nearly $158 million to organizations in the communities nationwide that Comcast serves. More information about the Foundation and its programs is available at www.comcast.com/community.